Indian security personnel guard as women voters stand in a queue to cast their votes at a polling station during the first of the five phase voting for state legislative assembly at Mahmoodpur village, in Samastipur district of India’s eastern state Bihar, Oct. 12, 2015. Ballots cast Monday by hundreds of thousands of voters in India’s eastern Bihar state will test Prime Minister Narendra Modi’s popularity and influence his ability to press ahead with an economic reform agenda. The crucial polls taking place in one of the country’s poorest states could also determine whether his right wing Bharatiya Janata Party pushes ahead with a Hindu agenda in the coming months. 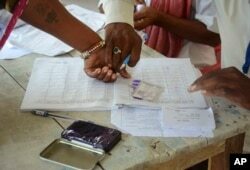 Monday’s elections in 49 constituencies was the first round of staggered polls that will be held over five stages across the vast Bihar state ending November 5. About 66 million voters are eligible to participate and the results will be released November 8. With the huge stakes, Modi has been campaigning extensively in Bihar, which his party wants to wrest from a regional party, the Janata Dal (United). The BJP is pitted against what has been termed “a grand coalition” forged by two regional leaders, current Chief Minister, Nitish Kumar, and Lalu Prasad Yadav. As in the 2014 general election, Modi has promised to bring jobs and growth to the poor and underdeveloped region, which is impatient for access to better education and development. Political analysts say development may not be a clinching issue in a state where politics has revolved around caste for decades. While the BJP is trying to garner the vote of upper caste Hindus, its opponents appeal to lower castes and Muslims. “Both sides are talking about development. But underlying it all is caste lineup. I have never seen an election so polarized along caste lines. There are signs of forward castes versus the backward castes”, said independent political analyst, Neerja Chowdhury, said from Patna. She said support for the BJP is more pronounced in urban than in rural areas. Opinion polls have forecast a close result. A victory would tighten Modi’s grip on national politics and on his party, and hand him more seats in the upper house of parliament, making it easier to pass crucial reformist bills on tax and land. A defeat will bring him under more pressure from opposition parties who are blocking his economic reform program and who accuse him of pushing a right-wing Hindu agenda. Modi’s spectacular performance in last year’s general elections was followed by victories for BJP in four states, giving him an aura of invincibility. But the party was unexpectedly trounced in local elections held in Delhi in February this year. An Indian polling official helps a woman put her thumb imprint before proceeding to cast her vote at a polling station at Samastipur district, in India’s eastern state Bihar, October 12, 2015. The election in Bihar also comes amid rising tensions over what some see as an effort by the BJP to push religious polarization. Since Modi took power, several states have tightened laws protecting cows, considered holy by Hindus. But the issue turned volatile when a Muslim man was mobbed to death on the outskirts of Delhi two weeks ago on rumors that he had eaten beef.